Are SmartStore.com.au products covered by warranty? Who should I contact for a warranty claim? What is your Refunds policy ? How can I provide proof of purchase for a warranty claim? Can I drop returns back to SmartStore.com.au? Can I get my money back if I do not want this item any more? 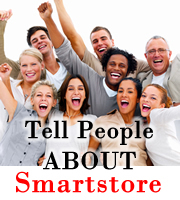 SmartStore.cm.au has a great reputation for dealing only with quality vendors, suppliers and manufacturers. We aim to source and sell products with warranty support where possible. Majority of our items come with warranty support. Please refer to each of our ads for warranty terms as they differ from item to item. Warranty is valid within Australia only. Please email us at sales@smartstore.com.au for all warranty claims. Please be aware if you undertake any repair work yourself or by an unauthorised repairer you will void any manufactures warranty. Your happiness is our number one priority at SmartStore.com.au. If you receive any products that are damaged or faulty, we will happily organise an exchange for you. Products within 14 days from the date of dispatch which are Dead on Arrival (DOA) will be replaced or repaired. Products damaged in transit must be reported to us within 24 hours of receival of product. Dead on Arrival (DOA) products must be returned back to us within 7 days. For all assistance with warranty and returns please email sales@smartstore.com.au. Replacement product will only be shipped after the faulty item has been received by smartstore. If your item is found to be working a charge of $35.00 applies and the item will be shipped back to you at your expense. To get this number, just email is with your order number and reason for return. We'll call or email you within 2-3 business days with an RA# for your order. The Customer Service Representative contacting you will have further instructions including return address for your easy return. Currently, smartstore does not automatically generate RA#s online. Shipments without a valid RA# clearly posted on the outside of the box will incur a 15% restocking fee. smartstore is not responsible for items returned without traceable markings (customer's name, address and RA#) on or in the box. All returns must be boxed and backed securely for shipping. Please place the RA number given to you by us on two sides of the carton being returned. All returns without the RA number will not be accepted. * NOTE: Please ensure that all original items including packaging, manuals, etc... are returned. It is the buyers responsibility to ensure the goods are adequately packaged to ensure that they are not damaged during return transit. We will offer a refund only if we are unable to replace or repair the item, or if item is substantially not as described in the advert. Minor variations in model, color, specifications are not reason for a refund. Refunds are only offered if we are contacted within 14 days from the date of dispatch. Refunds will only be issued by direct deposit, cheque or paypal. We do our best to present accurate, detailed information about every item we sell. If you have any questions, please email us before purchasing. Please ensure that you check systems compatibilty before bidding as no refunds are offered if item is not compatible. No refunds offered if you have changed your mind about the goods. However if you have bought the product from SmartsStore for the purpose of selling it to another person (eg bulk order) you may transfer the warranty. Your tax invoice will act as your proof or purchase. If you require another copy please email sales@smartstore.com.au and be sure to include the order number and your full name as registered on the SmartStore web site. Yes, we allow pick up's and drop off's. •	damaged the product by using it in a way it was not meant to be used. •	had a defect drawn to your attention before you purchased the product, for example, when a product is clearly labelled as second or faulty.